Dwayne "The Rock" Johnson loves fishing so much that he had a lake built on his personal family farm land. The Rock's fishing pond contains largemouth bass, sunfish (bluegill), bullhead catfish, and carp. He had his fish planted in there as little juvenile baby fish, and is raising them to be big healthy hogs. Live bait is delivered by a fish truck for the fish to forage on, and so they can get nice and fat, healthy, and raised to be aggressive. To help ensure that his fish thrive to the fullest, he has specialists come to inspect the water, vegetation and ecosystem. 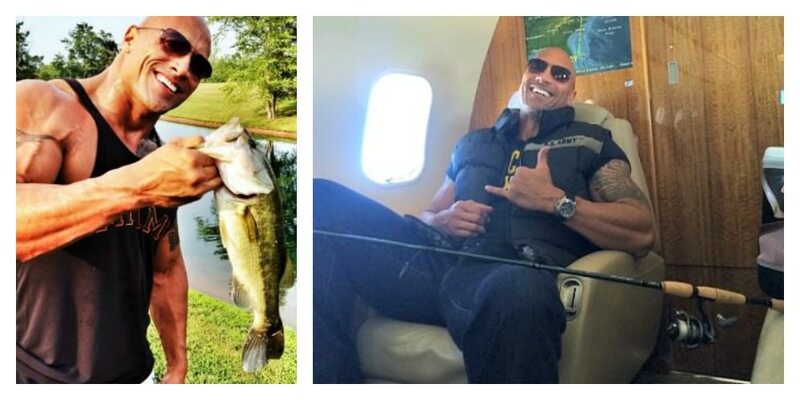 Fishing Pictures Of "The Rock"
These first two pics were posted onto Dwayne Johnson's facebook timeline. The largemouth bass was posted on July 6, 2012. The other of himself on the airplane with his fishing pole and cooler was added on November 1, 2014. The Rock with one of his largemouth bass. And on an airplane with his fishing pole. These Instagram posts are live posts. So, you can interact normally by following him, "liking" them, and commenting. As you can see in the following Instagram post, The Rock is fishing from the bank with a top water plug. He states that he's been at it for about an hour, but not even one of his ungrateful fat hogs has hit his lure. Regardless, I think that we all can appreciate that awesome view of his man-made freshwater fishing lake. In this video here he is showing off one of his largemouth bass he caught with a double willow blade spinner bait. Here's a bluegill he landed with the double willow blade spinner bait . This 200 pound tarpon took him an hour of fighting to finally be able to haul it on board the boat. Another largemouth bass. I assume that he also used a soft plastic lure rigged up weedless Texas rig, just as he notes in his Instagram post two days prior just under this one. The Rock caught this bluegill using a Texas rigged soft plastic lure. Most followers know The Rock as a former WWE (World Wrestling Entertainment) superstar/megastar champion. Also known as "The People's Champ". Signature moves included the Rock Bottom, which usually ended with the People's Elbow for his finishing move. During his hilarious skits of trash talking other wrestling entertainers, or arousing the ladies, The Rock would amuse the audience with the People's Eyebrow. Now days, Dwayne Johnson can be found on the big screen making one entertaining blockbuster hit movie after another, as well as a series of television shows, amongst a plethora of other great things. And to get away from the rigorous daily grind, he enjoys to unwind during his downtime on his family farm with his horses and fishing his freshwater lake.